This is a story about Pinza Triestina, an orange flavored light brioche, and the part it played in the lives of two sweethearts. Now, they both knew that pinza (translated pliers or clamp) was typically served as an Easter bread. If a family wanted pinza triestina, well, the signora of the house would just have to bake it. It wasn’t available in bakeries or stores. So, soon after the young couple married, the husband mentioned to his adoring wife how much he enjoyed pinza triestina. Immediately an idea popped into her mind. 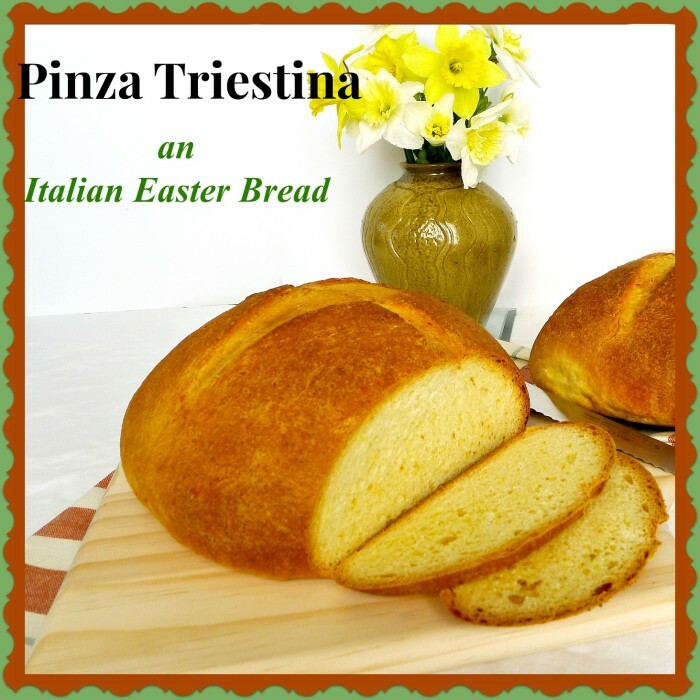 Easter was just around the corner, she would surprise him with a pinza triestina. In those days, ingredients weren’t easy to come by, but she was very determined and she was in love. As Easter approached, so did her excitement. That morning he feasted on pinza triestina and slices of prosciutto cotto (cooked ham). He enjoyed his sweet egg bread so much that the young wife decided then and there that she would make it more often — not just for Easter. She made it for his birthday, their anniversary, holidays, even to celebrate special events, like the news she was expecting their first child. And if things looked bleak? Well, she would set out to make the pinza so that it would remind them of good times and give them hope for happier times. They would sit together at the tiny kitchen table, and they would nibble on a small wedge of the delicious yellow bread. 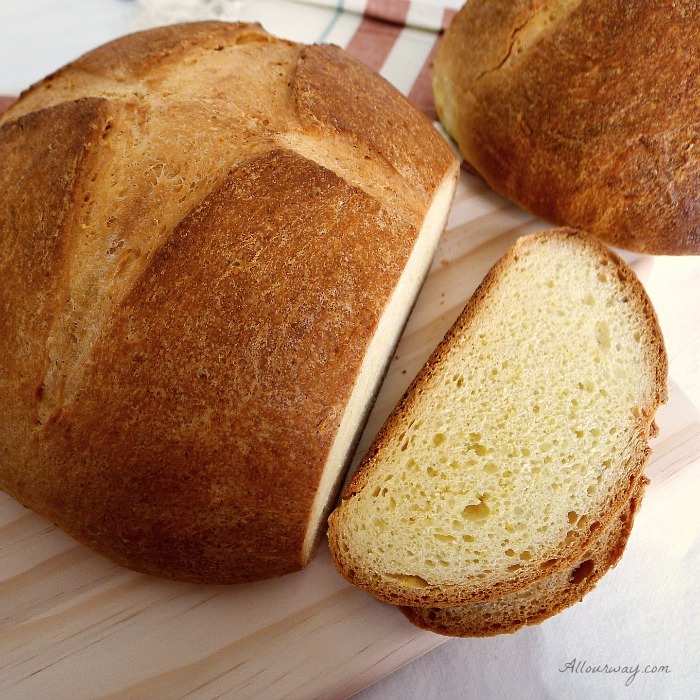 The small wedge would be accompanied with caffè if they were eating it in the morning or with a caffè correcto ( coffee served with grappa brandy) if they were enjoying the sweet bread as dessert. Yes indeed, the wife made many pinze triestine throughout the years — even for their 52nd anniversary. That special evening it was only the two of them that shared the pinza. They sat at the kitchen table and nibbled their small wedge of pinza just like old times. Then several months later, unexpectedly, her lifelong sweetheart was gone. They didn’t have a chance to say good-by; they didn’t kiss one last time. Life went on. She laughed. She cried. She enjoyed the rest of her family. But . . .
. . .she never made pinza triestina again. I’m sure you guessed by now that I’m talking about my mamma and papà. What a beautiful example of how two sweethearts should live their lives! Each one thought of the other’s needs first. Every day was Valentines Day for them. I now make this bread at Easter. It may sound strange, but I swear that they are in the kitchen with me, nodding their approval at the continuation of their loving custom. 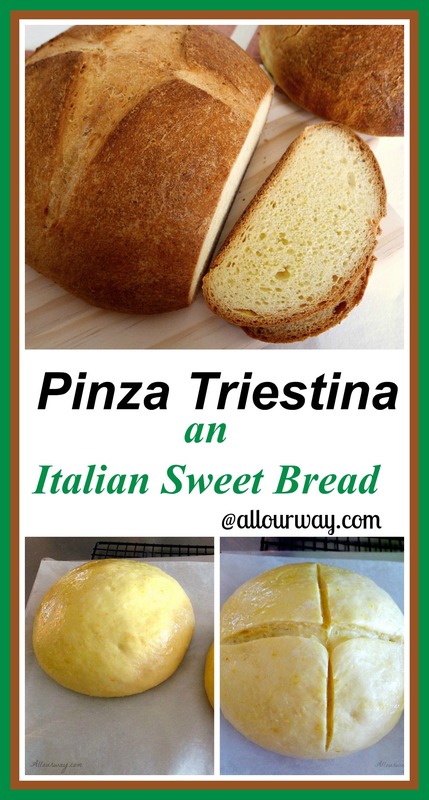 I hope you make the Pinza Triestina; it’s delicious any time of year. A delicious egg bread that is like a brioche but not quite as sweet or rich. It is good eaten any time and typically it is made for Easter morning. For the dough starter, sift the flour in a bowl and whisk in the dried yeast. Pour in the water and knead briefly. The dough will be sticky. Cover with plastic wrap and let rise until double in volume - about 1 to 2 hours. Put the dough starter in the mixing bowl of a stand mixer then the whole egg, 2/3 cup (120 g) sugar and 1 1/2 cups (200 g) of the flour and begin to knead with the dough hook. As soon as the dough starts to collect on the hook add 1/4 cup (65 g) soft butter and continue to knead with the mixer. Knead the dough on a lightly floured work surface until smooth. Place in a vegetable oil sprayed plastic container and cover with plastic wrap. Let rise for another two hours. Put the dough back into the mixer's bowl and add the egg yolks, the remaining 1/4 cup (40 g) of sugar, grated lemon and orange peel, the remaining 3/4 cup (100 g) of all-purpose flour and mix for another 7 to 10 minutes, long enough to knead the additional ingredients in. The dough will cleanly come off the sides of the bowl. Add the rest of the 1/3 cup (75 g) butter a little at a time. When it is incorporated transfer the dough on to a work surface and divide into two halves, about 400 grams each. Form the dough into tight balls by smoothing the dough from the top of the dough down and rotating as you do this. 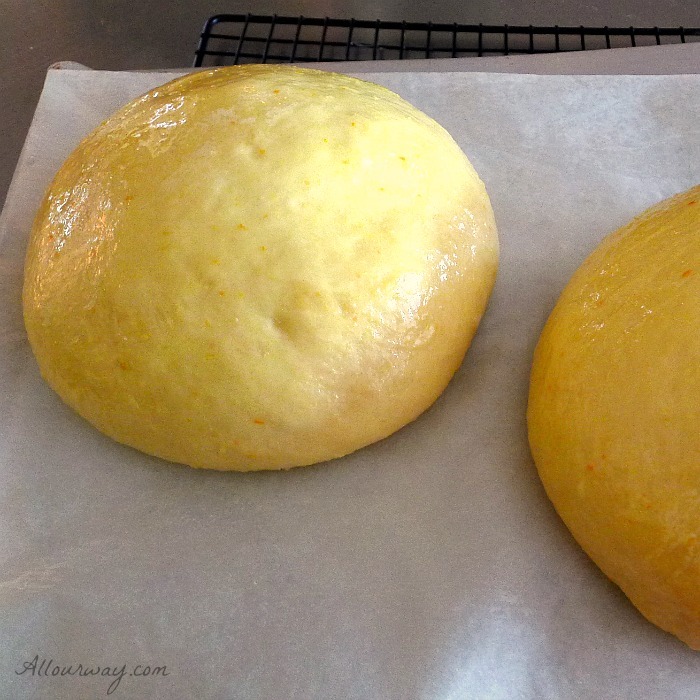 Put these two tight balls on a baking tray lined with parchment paper then let the dough rise for 2 hours more. The dough will rise. 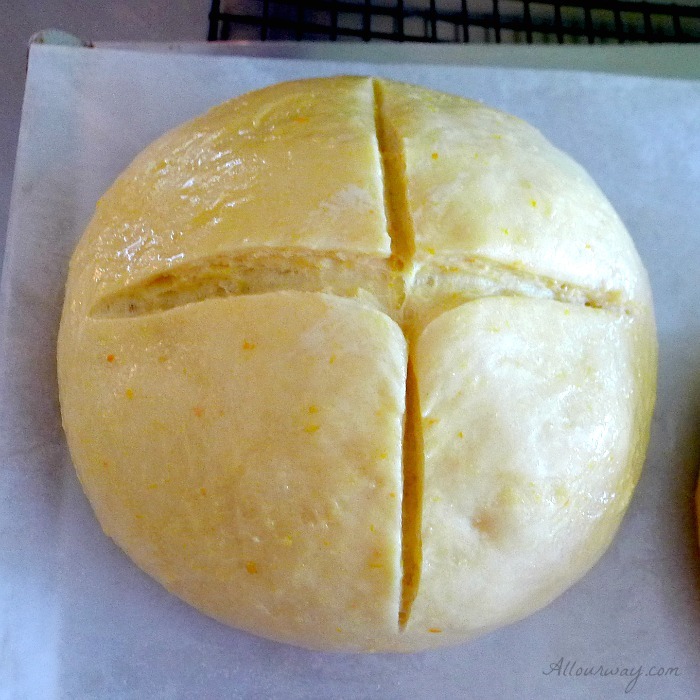 With a knife cut a large cross into the dough. The four points on the cross will almost touch the tray. Do this quickly making sure you don't drag the dough while you cut it or go too far into the dough. You are basically scoring it. Brush the surface of both pizzas with the beaten egg yolk and milk. Preheat oven to 350 F. check after 25 minutes; tent with aluminum foil if it appears to be browning too quickly. Bake for an additional 15 to 20 minutes. The pinza should be a deep brown when done and it should read 195 F at the center using an instant read thermometer. (It's easy to undertake, since it browns so quickly) Remove from oven and let cool on rack. 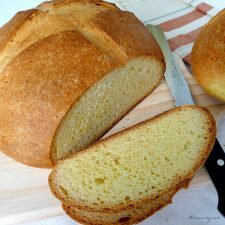 This bread is soft but firm and goes well with Easter cold cuts like ham and also with chocolate or jam. You could even put fresh strawberries over it. The Pinza Triestina can be kept covered for 2-3 days or freeze for later use. Note: Recipes and content from © All Our Way are copyright protected. Please do not use content or recipe without prior permission. If you want to share the information, please link to this post. Grazie. In planning a trip to Italy,I stumbled onto your website after a quest for the best Pinza in Trieste. I’m blown away by your story and similarities in the recipe. I was born in Trieste,F.T . and moved with my Father, a U.S. soldier, with my Mother and sister to the U.S. I too, have fond memories of my Mama making Pinza at Easter, all by hand. After her death, I have kept up the tradition and using her recipe, bake four loaves at a time. I send one to my older sister and to my sons and together we keep her memory alive. I do the same with her meat ravioli at Christmas. Many of your recipes remind me of her cooking. Thank you! Ciao, Al!! You are so welcome. It’s wonderful to hear from you! Do you make baccala? Whenever we could get it my mamma would make it for Christmas. Then there were the frittole and the strucolo de pomi. Now that we are living closer to our children and grandchildren I plan on making more holiday treats to share with them and our dear readers. I started the blog to keep the memories of my mamma and papà alive. I hope you keep in touch. I’d love to hear more about you and your recipes. Alla prossima.